Each month A Touch of Class employees will pick one pet of the month winner on our website. How the contest works: Each month we select one winner for our website. 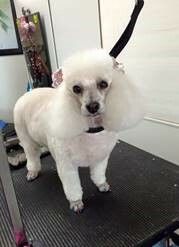 Please enter a couple photos of your dog or cat after being groomed in our salon. Then write why you think your pet is the most special. Winner receives 50% off next groom, appointment required. *Expires after 4 months. Pet of the Month– Our very first pet of the month is Puppy. She owns Mr. Phil Schrier a long time Yuma resident and military veterean. Puppy is a 6yr. old miniature poodle. She can be seen around Yuma in her matching bows and nail polish, usually in seasonal or holiday colors. That’s right, she lives a Diva’s life.